So what if it isn’t pretty? When I noticed I had some extra stuffing from the braciole I made the other day, I started thinking of a way to use it up. Remember, waste not, want not! Originally, I was going to use the portobello mushrooms I have by stuffing them, but midway through cooking I decided to save them for another time. I cut up some zucchini, whipped up some polenta and this was the result. Yum. That’s right, I said yum, even though it isn’t the most attractive dish. These types of creations rarely are, but they’re usually the best tasting 🙂 LOVE rustic cooking. Heat oil and garlic in a skillet over medium high heat. Add sausage and cook until no longer pink, then add stuffing. Stir together and cook for another few minutes. Add salt and pepper to taste. Remove from pan and cover to keep warm. Put a little more oil and the other garlic clove into the skillet. Add zucchini, salt and pepper and saute until cooked through. Take off heat and cover to keep warm. Follow instructions for polenta. When almost finished, add cheese and continue stirring. 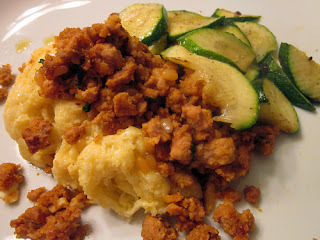 Spoon polenta onto plate and add sausage on top, with zucchini on the side. This entry was posted in Italian, leftovers, main dishes, mozzarella, polenta, pork, side dishes, zucchini. Bookmark the permalink. 6 Responses to So what if it isn’t pretty? 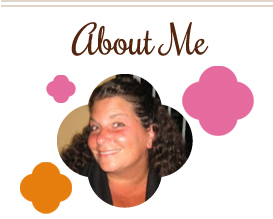 Melissa, this does sound really good. Nice job! Sometimes good food isn’t pretty! 😉 It does sound delicious though! Looks pretty delicious to me!